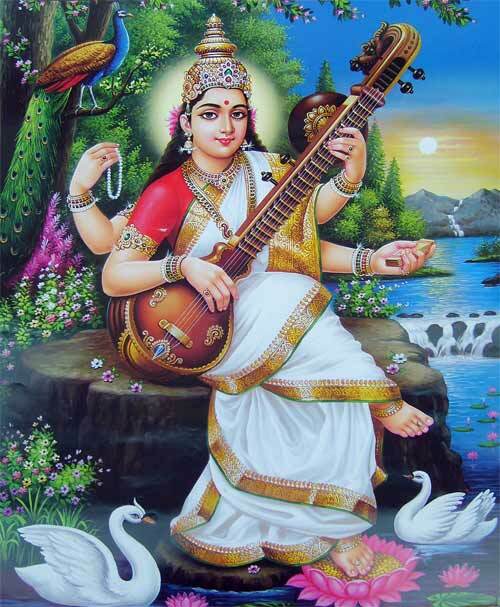 Saraswati Puja is an important part of the Navratri festival, especially in South India. Saraswati Puja is observed at different times in different parts of India especially during Basant Panchami. The last three days of Navratri is dedicated to Goddess Saraswathi in Karnataka, Tamil Nadu, Andhra Pradesh and Kerala. Saraswati Puja is also observed in Gujarat during the same period but in a different manner. Below is a step by step guide to how Saraswati Puja is observed in South India. The last day of Navratri, which is also the Mahanavami day, is observed as Ayudha Puja and Saraswati Puja. Books and tools are placed in the puja room or in front of the idol or painting of Goddess Saraswati on the previous day evening, which is the Durga Ashtami day. The books and tools are not touched on the Mahanavami day and they are removed from the pooja on the Vijayadashami day. Flowers – lotus, lilies or jasmine. If you are preparing prasadam or naivedya – then the ingredients of what you wish to cook. Usually, people make Vadai, Payasam using split peas or green gram or simple jaggery sweet. If you are already doing Navratri Puja, then you can use the same decorations etc. If you are only doing Saraswati Puja, then get your house cleaned. Keep all the books arranged. Keep the computer and laptop clean. Everything must be ready by the evening of the 8th day of Navratri. On the Mahanavami day, ninth day of Navratri, books and tools that are kept for Saraswati puja should not be touched. Most people do the Puja on evening of the eighth day of Navratri and on the Mahanavami day the books and tools are not touched. If you are already doing Navratri Puja, then you can place the idol of Goddess Saraswati in front of your Navratri Golu display. If not, then you can place the idol in prominence in the puja area. A white cloth is used to cover the idol of the Goddess. If you are using an image you can skip the white cloth or place it on tray near the image. Pray to Lord Ganesha first by chanting a simple prayer. Next venerate Goddess Saraswati with flowers, agarbathis, incense and chanting any shloka dedicated to Goddess. Now that you have invoked the Goddess, you can keep books and other objects that you wish to keep for puja before the idol. Sprinkle some flowers on the books and objects. You can also apply a small dot of turmeric paste and kumkuma on books and objects; but turmeric stains are hard to remove so do it carefully. After this you can place some flowers and akshata (uncooked rice with turmeric) on the deity. You can offer the prasadam or naivedya that you have made. You can chant any slokas or remain in meditation for sometime. The books and tools are removed on the Vijayadasami day after prayers and lighting a lamp.